Gliding into the sunny Swindon station, the smell of the picturesque Wiltshire countryside wafted into the ex-holidaymaker packed train, reminding of spring, growth and hope. It was, after all, the end of Easter. Chocolate eggs and Spring Lambs had been consumed, and snooker was back on the BBC. For many less fortunates, including Bradford City, the Football League was just about ready to be put to bed for another year. Outside the station two City fans, one in a pink away shirt and one in this year’s ‘out-of-stock’ and ‘now reduced’ home jersey, were catching their lift. Shame, as it was a lovely day for a walk. Particularly as over the road from the station was The Queen’s Taps, inside which the more fortunate Leyton Orient and Wolves were battling it out in the early kick off TV game. The skilful but yet predictable TV coverage couldn’t hide the lack of quality in the third division, and the close ups of Nouha Dicko and Chris Dagnall only served to remind what might have been for the Bantams. Richard Steadman scored a scrambled goal from a knock-down that could have for all the world been from a James Hanson assist and would have had Stephen Pressley-types Twittering ‘Dark age football’. Bombadier finished it was time to roll. Distance to the ground from the station is as minimal as the architecture. Think the hotchpotch that is Birmingham, but on a smaller scale – with a muddle of office buildings, hotels and ton after ton of concrete. Design-by-greed inhumanity. In no time the ground nears and now it’s a wander through terraced houses that appear to be largely occupied by immigrants. The wealthier locals have long since moved out of this town. It’s a place that boast more jobs than city-based residents – a ‘fact’ that Robins’ supporters blame on their low average attendances. Similar circumstances don’t stop ‘the Faithful’ travelling down the Aire Valley. Cricket comes to the rescue and provides harbour for those drawn to more aesthetic views. Head to the pavilion from the back of the County Ground, and enjoy good cheep beer in pleasant surroundings with friendly local football fans. There, the Reds were rather hushed about their play off prospects, but at least they had something to play for. They seemed quite pleased and quietly confident as they read their team line up via their smartphones. City also appeared to be keen to finish well with the strong team that they were putting out. They’d be no room for experimenting with youth today, as Phil Parkinson had only made one change from Friday’s welcome victory over Peterborough – Kyle Bennett replacing the ‘resting and recuperating’ James Hanson. Over the cricket pitch outfield and into the throng of the crowds outside the ground the mood was similarly subdued. 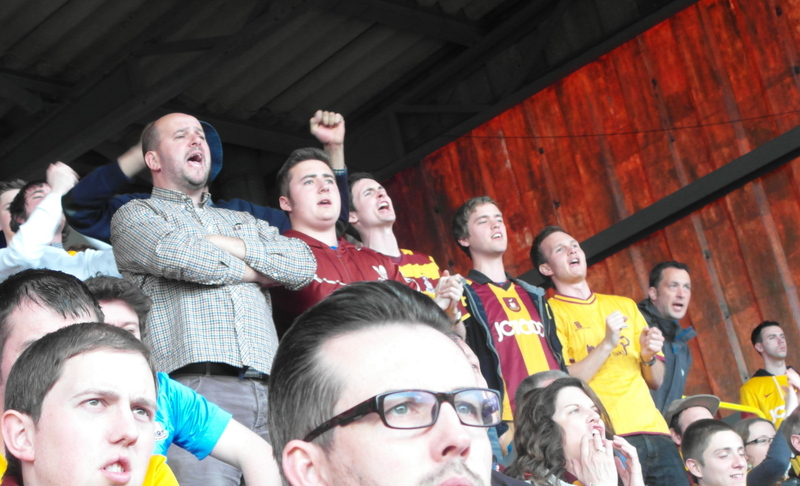 Some City fans cheered the place up with happy away-day smiles and good-to-see-you-again handshakes. It’s always good to see fellow supporters and feel part of a community. This time a communion of one short of three hundred would be held in the Arkells main stand. This is a seventies type stand that looks like it has been constructed by builders more familiar with the construction of local farm buildings, for which they had used similar materials. However, they’ve installed chairs and not hay bales and whilst they were quite tight there was no pillars obstructing a good view. 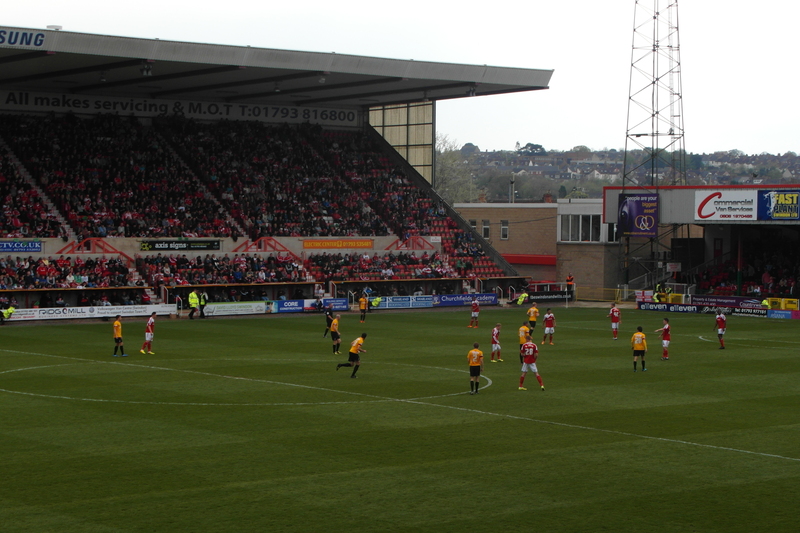 Quite a few Swindon fans choose the newer stand opposite that looks similar in size to the Midland Road stand. Both ends behind the goals are poor and would suit a tank, or even a local tractor, driven over them. Mentioning tanks. What’s happened to Nathan Doyle? Has Nick Allamby been released? Oh Nathan. Stand out player for the wrong reason during the warm-up. Some timber fella. It seems City will have a young man trying to play as an old man and an old man trying to play like a younger man, as Doyle sits in front of the back four and Gary Jones tries to invigorate a strange looking midfield four. This consists of Bennett and Adam Reach playing out wide left and right respectively and the anomaly of Raffaele De ‘Rye’ Vita in the middle with our captain. This left Stead playing up front in a 4-1-4-1 formation. ‘Pleasing’ is how the opening exchanges between the teams can be described. Swindon like to pass and look to slide the ball along the floor to onrushing attackers –the benched Aaron ‘goal machine’ Mclean must have looked on wistfully at some of their attacks. However, City were showing why they’d collected several clean sheets recently by defending magnificently and creating the odd chance on the break. The back four were all playing well in front of a confident looking Jon McLaughlin in goal. Stephen Darby was having a game of it with Pritchard, and the earlier-maligned Doyle was tremendous on his holding/quarterback role. Legless or ageless (delete as your want, forum fans) Jones so nearly put City in front from a free kick on 14 minutes after Bennett was fouled, nearly catching keeper Foderingham out with a near post thunderbolt. Then on 23 minutes Stead – now looking sturdy rather than stealthy in his latter years – nearly gave City the lead with a curling effort that said much about why he hasn’t a high career strike rate. He was leading the line well though, and holds the ball up impressive in contrast to Hanson’s nod-on style, which was more beneficial as it gave City’s mainly deep seated midfield time to join the attacks. Evening things up, Swindon were very much in the game too; but their passing game wasn’t quite making the openings that it promised. Perhaps this was nerves, perhaps they’d heard their play off rivals Peterborough had scored early on, but more likely it was how City were set up. Well done Mr P.
Xerox this: City looked a great side capable of promotion in the first twenty minutes. But it had to end and unfortunately it was at their own hands. Signs of things to come were evident when Darby got caught with the ball near his dead ball line and played a not-so-clever inside pass to McArdle. 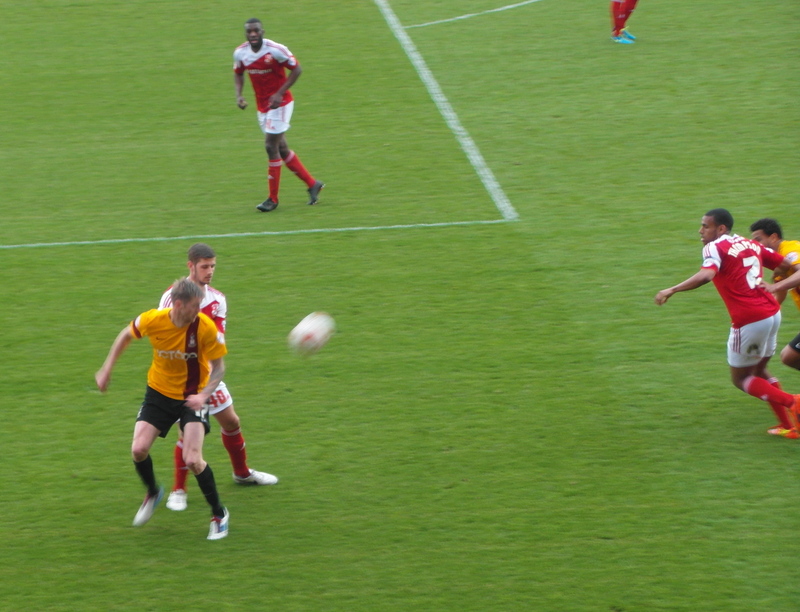 This left him rather exposed and soon dispossessed by Pritchard, who blasted a shot that only just flew over the bar. He should have scored. This affected an increase in confidence with the Robins’ young team who thereafter played to their potential. Andrew Davies sensed this and tried to intimidate them by sliding hard into the back of Pritchard, which earned him a booking on 30 minutes. The City fans also realised the tide was turning and began the first chants of the day from either fans – it was sunny after all. Things picked up briefly and Darby put in some fair but firm tackles that drew chants of “Off to Brazil, he’s off to Brazil, Darby’s off to Brazil”. Brilliant. That was about it for the first half apart from a few near efforts from Smith and Thompson for Swindon that didn’t really trouble McLaughlin. Also of note was Jones’ hard work that at one point got City a free kick as he raced (yes raced) thirty yard (yes 30) from a quick throw out from our keeper that resulted in him being up-ended by McEveley who was subsequently booked. As the half’s whistle blew both managers, who had stood diligently like rocks on the edge of their technical areas, uncrossed their arms and walked in contented. It had been a good contest thus far. Unfortunately, something appeared to happen in the City camp over half time oranges. James Meredith, who was having a kick about with the other subs on the pitch, was hurriedly brought in just before the teams reappeared –minus Doyle. After his performance in the first half, it seems cruel to report what one wit in the crowd said but “had he gone on a late Easter egg hunt?” Mezza initially took up Doyle’s position in front of the back four. However, after a dodgy first touch and a blazed effort from an onrushing Pritchard, Parkinson moved him to the left midfield in a four and pushed Reach behind Stead in a similar formation to Friday night. This appeared a strange move, given that it gave Pritchard even more room to play his attacking midfield role and left Jones and De Vita in the middle stretched and looking slow and inexperienced respectively. Still, the City players were trying but the new tactics were very much playing into the home team’s hands. 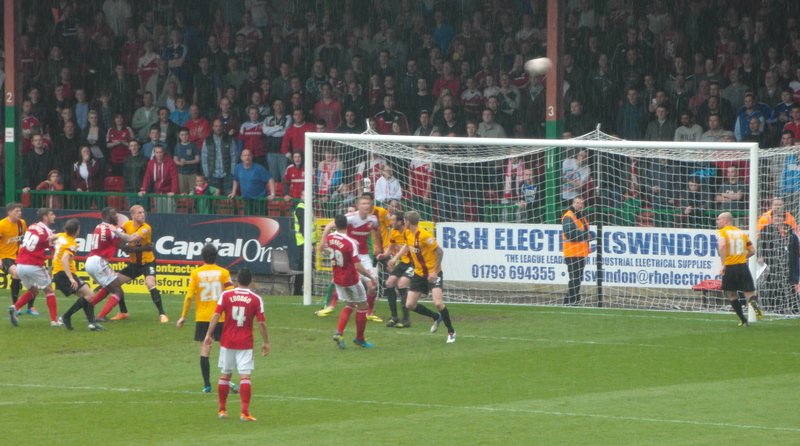 On 50 minutes Pritchard went close with a blast that went for a corner that resulted in two heroic blocks by Darby. 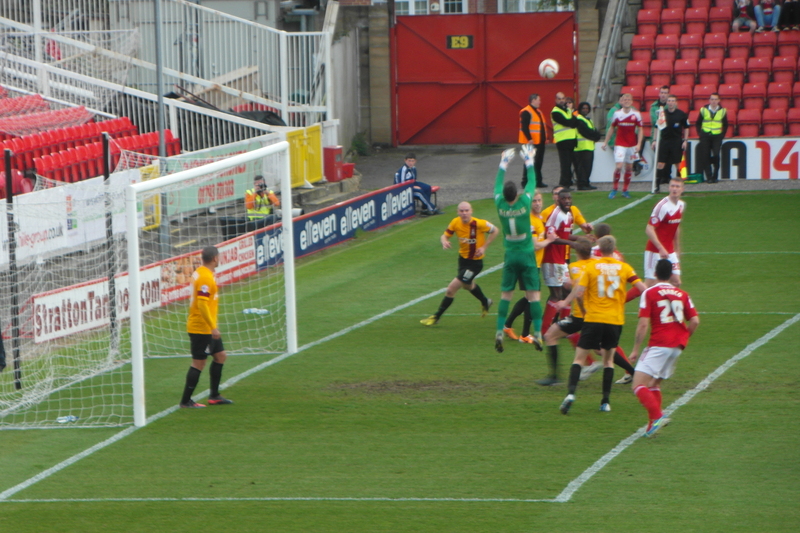 Five minute later McLaughlin made possibly his best save of the season from Smith’s downward header. A friendly but nervous voice in the crowd said “their goal’s coming” and so it proved. After a shot by Pritchard was blocked, the by-now-pedestrian-looking De Vita failed to get to the rebound and Lee Cox neatly curled the ball low into the bottom left corner. Sixty-three minutes had passed but in the time remaining City got worse rather than better. The goal signalled the removal of De Vita, who on this showing looks about as affective in this division as Connell did in the league below. On comes ‘Toothpaste’ McLean from the bench, taking up the behind-the-lone-striker role from Reach who moved to the left – his third different position of the day. It was all looking a bit like the desperate times when Luke Oliver was deployed up front. The changes were doing nothing to stem the flow of the game, as City were left chasing shadows – particularly Prichard’s, as he unleashed a volley around 80 minutes that should have seen the Robins ‘home and hosed’, but for another great save from McLaughlin who pushed it onto the post. Other than that Swindon were restricted to half-chances while City played the role of no-hopers. Even the late but regular substitution of Garry Thompson for the very ineffective Bennett didn’t lead to much bar a couple of fruitless forays forward. From the loss of Doyle at half time until the final whistle, City had increasingly fallen apart like a cheap suit. Swindon were well worth their win, but had been somewhat handed it on a plate. Walking from the ground in the early evening sunlight, the disgruntled City fans were soon caught in thoughts of summer recruitment. Solving the midfield problem surely has to be top of Phil Parkinson’s agenda after today’s near-debacle. Rumours already abound regarding signings being lined up, with Walsall’s classy centre-back Andy Butler being mentioned. Perhaps, however, after this showing he needs to deny his megalomania for centre-backs and recruit a more balanced squad, starting with a replacement for our brilliant but fading-like-the-Easter-sun captain. It pains to say it. Surely Garry Jones should be retained as a player coach ! From what I’ve seen Jones has been outstanding and a great credit to footballers with the way he has performed and conducted himself. I think it would be good if he could be club captain next year and concentrate on being a real impact player offering 30 mins at the end of games. He could really make a positive contribution in games that are tight and bring home the extra points. However, he apears a 110% type guy and as such I’m not sure he’d be satisfied with that. If an ambitious club from the league below come in for him with similar dough and a real full time playing job he may be tempted. I hope our club can accommodate him somehow though. 1. What wonderful, and witty, support from the 300 or so fans. 2. Tremendous effort from Jones and Darby. 3. 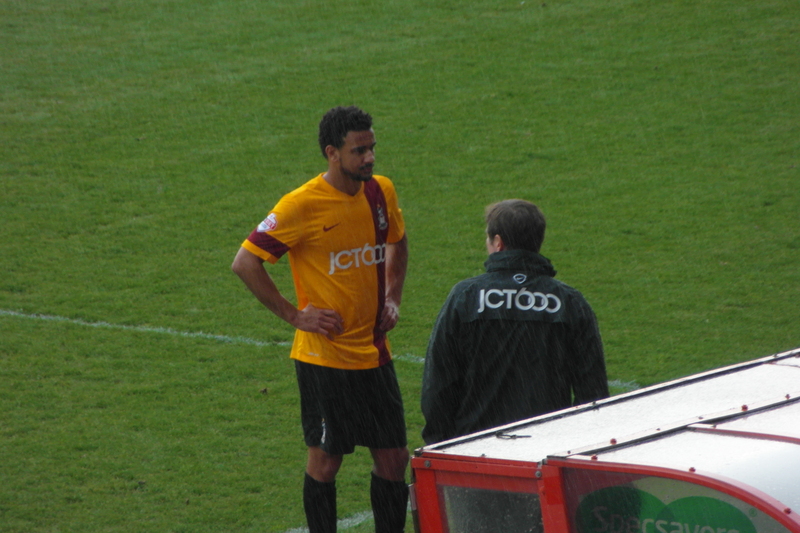 McLean looked a good player, starved of good passes. Reach was poor. Stead looked terribly slow. Half-time substitutions and apparent tactical changes were baffling. De Vita was poor. 4. Decent game to watch, and City were hardly second-best, and possibly do not need to improve greatly to get in the play-off shake-up. 5. Kids got in for £1, mother £25, hardly encouraging people to watch. By the way, I watched Wolves v Orient, and thought they were 2 good teams. We watch, on TV, too much top Premier League, and this blinds us to the skills of lower down. Assuming City are safe, which they are, I think this has been a good season. I would have taken 16th, and think I will get it. We lost Wells, then Reid, and have survived. 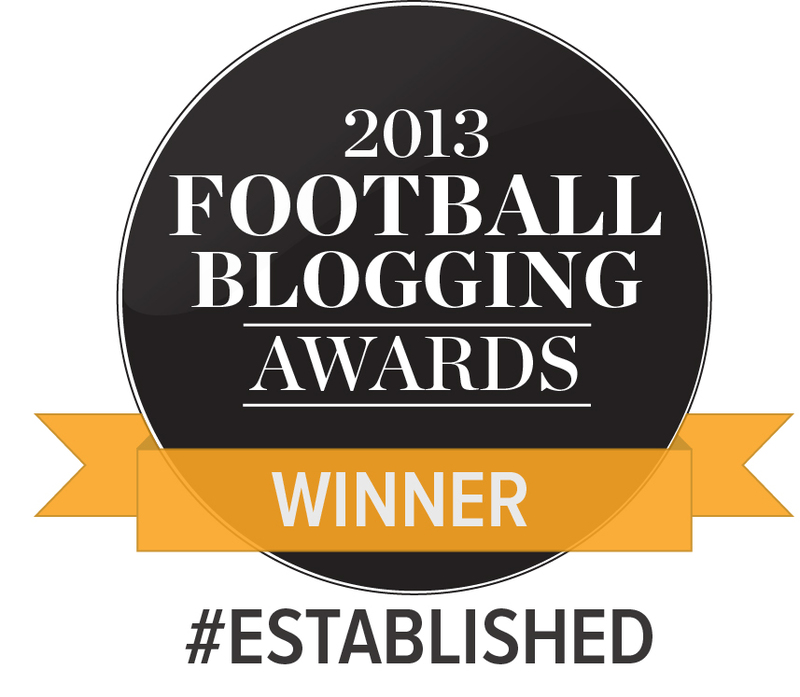 Considering we only went up due to Exeter’s collapse, I am very pleased. Following the controversy surrounding the abuse of Notts County’s Lee Hughes a year or so ago, I posted a comment that I would never take my grandchildren to a football match because of the general language and behaviour used by football supporters. Yesterday I broke that rule by taking them to watch City play at Swindon. Sitting with the City supporters, I have to say that it was a most pleasurable experience, both for myself and my grandsons. It was their first football match. They are both Gloucester born and bred but at the end of the match they both said that WE were unlucky to lose and they have both decided that they would like a City shirt for their birthdays. The match itself was “nothing to write home about” but the supporters made the trip worthwhile. So “take a bow” all you City supporters, you’ve done your bit in recruiting two new supporters! Great match report David. A really entertaining read. My heart sinks when I hear talk of releasing Gary jones. It’s pretty clear that we need strengthening in the middle but I just hope the club can find some way of keeping him with us given that he might not play as much as he does now. Folk heroes like the magic man don’t come along very often. Also.. I agree with Richard above. Going to see city away is great these days. Our away support is loud, often hilarious and has become a place where I’d be happy to take the family. We’ve also massively upped our game with the songs… Hats off to those who come up with them… The days of our songs defining us as simply a club that hate L**ds are long gone. We should be proud of our away support. Thanks Dean. It’s always nice to feel that ones effforts are appreciated. I agree that the crowd at away games appears to have improved. I too was at that game in Nottingham and also felt saddened at some of the vile comments and behaviour. However, they seemded to be made by two groups of less mature adults with beer on board. Fortunately, I haven’t seen these folk or that kind of behaviour since. The game itself marked a turn in the clubs fortunes and maybe support thereafter. The much criticised internet forums appear to have made a positive contribution in that ideas for new songs can be ‘aired’ and lead to everyone singing from the same song sheet (so to speak). I also thought we learnt a lot from the tremendous support Swansea got in the final, which we have certainly taken forward at home matches. It gives great heart to here that someone such as Richard can take his grandsons to a game and them come away with such a positive experience they are keen to get involved. Nice photo of me at the front of the crowd shot, but cropping below the ‘tache was a bit harsh.